Limited Edition Art - 24 x 36 Standard Number. Comes with Certificate of Authenticity and Limitation. 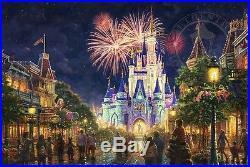 Brand New / Never Displayed / 100% Authentic From Thomas Kinkade Galleries of New York & New Jersey. For the Kinkade family, the yearly pilgrimage to the Walt Disney World® Resort was always an enchanting inspiration. Thomas Kinkade once said, Two of the dream-memories we take from childhood on our lifes journey are the wonder and excitement of the Walt Disney World®Resort and the soaring majesty of castles. It is this wonder and excitement that greets us when we first step through the tunnel under theWalt Disney World® Resort Railroad and travel back in time on Main Street, U. ® Inspired by Walt Disneys hometown, Walt wanted this land to relive a simpler time filled with happy carefree memories shared with family and friends. As you journey along the Victorian-themed Main Street in a horse drawn trolley, fire engine, jitney, horseless carriage, or on foot, youll pass such hometown staples as the Main Street Bakery and Main Street Cinema from a time and place long since passed. Main Street leads us into a Magical Kingdom and to the soaring threshold of the majestic Cinderellas castle. Lit at night by the Wishes Nighttime Fireworks Spectacular, it reminds us of the wishes we all share for the magic of simpler times, happy endings, the laughter of children and the love of family and friends. Thomas Kinkade Studios is proud to present Main Street, U. It is our hope that you will join us in celebrating the magic. Thomas Kinkade Limited Edition Canvases combine old world craftsmanship with the finest materials and latest production technologies to produce extraordinary canvas artwork. Our reproduction process captures not only the color and mood of Thoms enchanting original painting, but the actual brushwork as well. Every piece is hand-retouched by skilled artisans, giving the painting a look almost identical to the artists on-easel original. Vibrant colors, rich textures and color tones accurate to Thoms original brushstroke are the hallmarks of your finished piece. The Standard Numbered Canvas is individually hand-highlighted and numbered with the designation of S/N in the numbering process. Hand highlighted with fine acrylic paints by skilled artisans. Long-life pigment inks that outperform conventional press inks. Edition number is applied to each Canvas Limited Edition. Individually numbered Certificate Authenticity matched to the art piece. It is our highest goal and best intention to provide exemplary customer service. Open and honest two-way communication is the key. 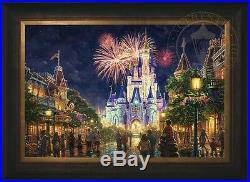 The item "Thomas Kinkade Main Street USA 24 x 36 LE S/N Canvas Framed Walt Disney World" is in sale since Saturday, September 17, 2016. This item is in the category "Art\Art Prints". The seller is "thomaskinkadestudios" and is located in Morgan Hill, California.